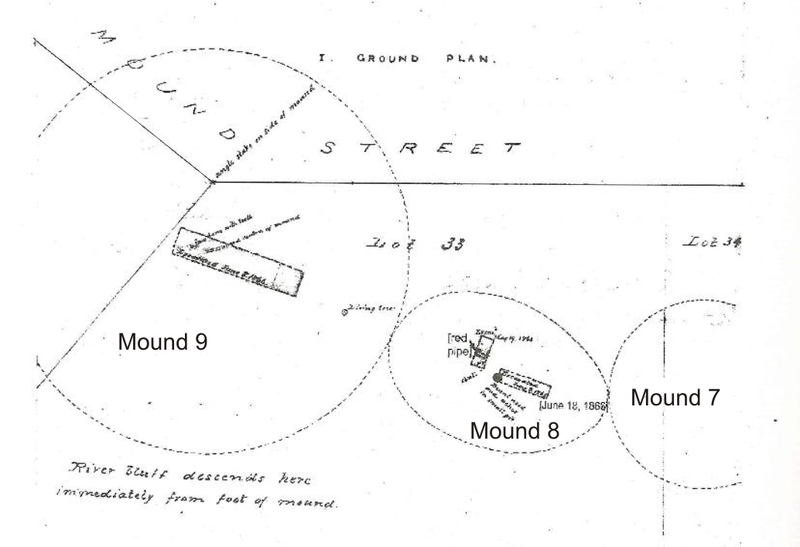 Figure 1: Solid circles represent mounds that still exist, and dotted circles represent mounds that existed when Lewis mapped them in the early 1880's. "On August 18th, No. 1, which was 23 feet in diameter, and 2 feet in height, was excavated, and at the depth of three feet were a few decayed human bones in a small heap evidently parts of three skeletons covered with eleven large muscle shells." "[… on the 2nd of July, 1867] mound number , situated on the extreme point of the bluff, was opened by sinking a shaft ten feet in length and five feet in width. At a depth of a little over four feet a fragment of a left femur was found, and at a depth of six feet four fragments of a skull, and at ten feet a fragment of a right femur was exhumed, but beyond this nothing else of interest was noted." "Fragments of two freshwater shells were also found in this mound [on July 2nd, 1867] as was a sharp, angular piece of stone". "August 14th, 1882, on which date with the necessary assistance an excavation was made in Mound No. 3, which was 60 feet in diameter and ten feet in height. Near the center, at the depth of three feet four inches, was a decayed skull, and directly beneath it some ten inches was a second skull and a piece of partially decayed oak wood nearly two feet in length and five inches in diameter. On the same level, five feet eight inches east of the center, were four decayed skulls all crushed together. About one foot further to the east of these was the seventh skull, which proved to be a rare find, indeed I know of nothing similar ever having been found in the mounds or ancient graves. The facial bones of the skull in question had been covered with red clay, thus producing an image of the original face. Unfortunately the pressure of the earth around it had forced it somewhat to one side and out of shape, and a small portion of the clay covering the lower jaw fell to pieces, thus exposing the bone and teeth. Apparently the back and top of the skull is wanting, but from general appearances this portion has been pushed inward. From the size of the skull and the teeth, it is evident that it belonged to a child of about five years of age. This specimen was immediately photographed, and is now in as good condition as when first taken from the mound. On the same level, two feet south of the center, was a calcined skull all in fragments, and fifteen inches south of west from the latter were portions of a skull and some fragments of human bones which were likewise in a calcined condition. Near the center, and at a depth of seven feet seven inches, were two large boulders, and beneath them were some broken human bones which had been gnawed by some animal probably a wolf. In various sections of the mound isolated human bones and many muscle shells were found. The excavation was carried down to the depth of eleven feet, but nothing else of interest was found. In constructing the mound, there was evidently an attempt at stratification, but the lines were not well defined, so that measurements were made." Further notes: Similar funerary clay masks have since been found at several other places in Minnesota. At the Steele Mound Group near Shakopee, MN, Arzigian (p.493) writes "...[two] burials had clay eye plugs, thought to be of bluish green Decora shale, and the adult cranium had a clay mask over the frontal bones". Arzigian (p.333) also says that "a possible clay/ocher mask" was found at the Howard Lake Mounds near Forest Lake, MN. Near the border with Canada in McKinstry Mound 2 (dated as about 1200 AD) Arzigian (p.422) says that skulls were found that "...had clay eye plugs in the eye orbits or clay masks". Winchell (p.263) writes that sometimes the fingers of the corpse were squeezed around a lump of clay so as to leave the impressions of the fingers upon it. Clay funerary masks have also been found in the Outlet Mound Group (dated as about 50 BC) near Madison, WI, the Lower Wakanda Mounds (about 1200 AD) near Menominee, WI, the Cyrus Thomas Mound Group (later than 500 AD) in Rice Lake, WI, and the Turkey Creek Ossuary (about 1200 AD) in LaSalle, Ontario. "[On August 18th, 1882], No. 4, which was 28 feet in diameter and two and one-half feet in height, was opened, and on the natural surface was a decayed human skull and traces of other bones. The skull was in an upright position, facing the north, and resting upon the top of it were two large muscle shells. The approach or graded way, which extended outward from the base of the mound 20 feet, was 16 feet in width and 2 feet in height. In it at the depth of fifteen inches was a decayed human skeleton, with the skull toward the center of the mound, and a few muscle shells mixed with the bones." Further notes: One example of the extensive landscaping that has been done in the park is the area just south of Mound 4. Lewis’ map showed a ravine that reached up past Mound 6 to nearly the edges of Mound 4 and 5. A walk along that portion of the path shows no such "dip" in the present day terrain. Park landscaping has leveled off many such areas of the park (most likely in the 1896 renovations) using fill that would contain much late-19th century debris. The actual level of Mounds 4 and 5 (and possibly Mound 6) could well have been a few feet below the present surface level. "Dr. De Montreville states that on the 2nd of July  an indistinct mound (number 5) was opened. Near the center, at a depth of three feet 10 inches from the surface, were 'the skeletons of a male of about five feet 11 inches in height, also what is thought to be the skeleton of a female of about five feet in height, the former in a good state of preservation. The two skeletons lay in very close juxtaposition, in fact the bones may be said to be commingled, and were apparently laid upon their sides facing each other. The most noticeable feature was the almost entire absence of the bones of the skulls, the most careful research failed to discover more than what might be thought to be a minute portion of the cranium bones." "The only other discovery within this mound was a piece of bluish appearing stone. Much of the rest of the mound had eroded and fallen down the steep bluff" [i.e. the ravine discussed above in the Further Notes for Mound 4]. "[On August 18th, 1882], No. 6, which was 18 feet in diameter and 1 foot in height, was… opened. At the center, at a depth of fourteen inches, was a lower jaw, the end of a left humerus, an arrowhead, a rude, chipped implement, and a large muscle shell." "On the 12th of June, 1879, in company with Mr. William H. Gross, an excavation was made in Mound No. 7 of the group located [in Indian Mounds Park]. We found it to be 70 feet in diameter, 12 feet in height, and composed of clay, loam and sand more or less intermixed, but no stratification was evident until the base was reached. Near the center, at the depth of seven feet, was a well-preserved bone implement, which had been rudely sharpened at one end as if intended to be used as an awl or perforator. From this point, and extending downward, was a round stake of about three inches in diameter, a little over two feet in length, and somewhat sharpened at the lower end, but so much decayed that it fell to pieces on being removed. At the depth of eleven and one-half feet were five pieces of wood which were about eight feet in length, and lying parallel with each other on a nearly north and south line. The central piece, and the piece on each side of it, were about seven inches in diameter and about two feet apart, from center to center; and the two outside pieces were about five inches in diameter with a space of about fourteen inches between them and the pieces inside. The top of the central piece was somewhat flattened naturally and on it were seven boulders which were from six to ten inches in diameter. These pieces of wood rested upon a thin stratum of black loam some two inches in thickness, in which, beneath the central piece, were some decayed human bones, of which only one section of the vertebrae and a part of a humerus were well preserved. Beneath the north end of the piece on the east side was the major portion of a human skull, on top of which was a right femur, both of which were remarkably well preserved having the appearance of not having been in the ground very many years, but doubtless this was owing to the fact that but little if any moisture could penetrate to this point. Below the loam was a stratum of charcoal and ashes from one to two inches in depth, and beneath the latter a stratum of yellow clay five inches in depth, packed very hard and showing evidence of heat. Beneath this hearth if the name is applicable was a six inch stratum of loose, yellow, sandy clay, containing a few pieces of broken pottery composed of shell and clay, some small fragments of human bones and a few teeth." "The following is an abstract from the report of William H. Kelly, which is dated June 11th, 1866: 'On the 19th of May, the day appointed by the Council for the excavation to take place, the men engaged did not present themselves, and not wishing to postpone the work, the excavation was necessarily confined to one of the smaller mounds, the work being performed by two members of the society Messrs. Hill and Kelly. The mound (number ) selected was located near the center of the lower group, elliptical in form, being 42 feet in length, 28 feet in width, and four and one-half feet in height. An excavation was made in the western half of the mound, and at a depth of three and one-half feet a layer of red earth (vermillion), about one inch in thickness, was met with, of irregular shape, about two feet in length and one and one-half feet in width. At a depth of about four feet several pieces of lime rock were uncovered, and beneath these were several fragments of human bones, a broken earthen pipe, composed of broken stone and clay, and near them a large number of sea-shell beads closely packed together, which from their position it was surmised that they had formed a bracelet. On the same level, all being located within a space of a few feet but without any regular order, were several other human bones including vertebrae, a part of a lower jaw and a part of the lower portion of a skull which was lying upon its left side. On June 8th, under the supervision of Mr. Hill, the eastern part of the mound was excavated. Near the center of the mound was a pit or fire-place one and one-half feet in diameter, over one foot in depth and filled with charcoal and ashes, among which were two pieces of unburned bones. The bottom of this pit was nearly six feet from the top surface of the mound. At various places in the mound were pieces of decayed mussel shells and charcoal, and about two feet above the pit two pieces of broken pottery, composed of shell and clay were found.'" "[In 1895] this mound was graded away by orders of the Park Board, in order that a better view of the river might be had from the street. On September 25th, while the graders were at work on the southern side of the mound they unearthed the remains of four skeletons. When the dirt was removed so that the position of the bones could be seen, it appeared that the first or upper skeleton had been laid in a reclining position, the skull, vertebrae and ribs were on a slightly higher level than the bones of the lower extremities. Directly beneath this skeleton lay another, crosswise, and the third and fourth ones were still lower down, though not entirely separated by earth from those above them. Later in the day two thin pieces of hammered copper were found at a point some two feet distant from the bones towards the center of the mound. The larger piece of copper was crescent-shaped, about seven inches in length and two inches in width and had evidently been used as an ornament. The other piece was similar in shape, and so thin that it was practically in pieces when found. It was about four and one-half inches in length, two inches in width and probably used for a like purpose. Four pieces of an earthen pipe composed of broken stone and clay were also found, together with a number of mussel shells and some small pieces of pottery." "Mound 9 of this group was opened by the late E.D. Neill in 1856. The mound which he opened was 18 feet high and 260 feet in circumference, and at a depth of 3 or 4 feet afforded a human skull, which crumbled upon exposure, and perfect shells of human teeth, the interior being completely decayed." " On … June 8th, , an excavation twenty-five feet in length and five feet in width was made in the largest mound (number ), which was formerly eighteen feet in height, and which was partially excavated by Dr. Neill. At various depths, from four to ten feet below the bottom of the half-filled excavation, pieces of charcoal and fragments of mussel shells were met with, and at ten and one-half feet a human lower jaw which evidently had belonged to a youth of about eight years of age, was exhumed. The excavation was carried down to a depth of about twelve feet, or about fifteen feet below the former top surface of the mound, but nothing else of interest was found." Further notes: The path of Mounds Boulevard (then named Hoffman Avenue) originally came up the hill and then took a 35 degree turn at edge of Mound 9, and proceeded straight east in a path that would have taken it straight through the position of the present pavilion. The disregard for antiquities by the city planners of the mid-1800’s is demonstrated by the way in which their straight line platting of the street took a "pie-shaped bite" out of Mound 9. The mound was later rebuilt when the position of the street was was moved slightly farther to the north – but the dirt they used would have contained late-19th /early-20th century debris. Figure 2: Sketch showing positions of 1866 excavations, and the "pie-shaped" section removed from Mound 9 by the original path of Mounds Boulevard. "… [on August 13th, 1882] an excavation was made in No. 10, which was 46 feet in diameter and 8 feet in height. At the depth of four feet two inches, and three feet southeast of the center, a decayed human skull and two small arrowheads were found. On the same level, three feet three inches nearly southwest of the center, was another decayed skull and three sections of vertebrae. At seven and one-half feet was a stratum of charcoal and ashes two and one-half inches in depth. Scattered through the mound were many muscle shells." "[On August 18th, 1882, found]] in No. 11, which was 20 feet in diameter and one and one- half feet in height, at the depth of two and one-half feet, were a few decayed human bones, evidently the remains of one skeleton, and two muscle shells." "On August 17th  No. 12 was excavated. It was 51 feet in diameter and eight and one-half feet in height. Nothing of interest was found until a depth of nine feet was reached, at which point was unearthed the top of a conical heap of boulders and flat pieces of limestone intermingled, the center of which was a little west of the center of the mound. The heap being entirely uncovered measured nine feet in diameter and nearly two feet in height. Beginning at the apex, all the stones were carefully removed, and it was found that they rested upon an apparent floor of flat pieces of limestone some two and one- half inches in thickness and of irregular outline. The excavation was thoroughly cleaned out, and on removing the stone floor it was found to be a covering for eight apartments or cists, which were about seven inches in depth, and were formed by placing flat pieces of limestone, which were from two to two and one-half inches in thickness, on edge. Within each cist were human bones, but in no instance was there a complete skeleton. Human bones were also placed in the angles (marked + in the diagram), and were covered over with pieces of flat limestone. The cists were somewhat irregular in length and width, so that the dimensions are not here given, but the diagram shows these irregularities, at the same time giving their exact shape as near as it is possible to do so. All of them were filled with black loam, and the bones, relics, etc., were lying on the bottom, which was the natural gravel of the bluff. Besides the bones, Cist No. 1 contained two muscle shells and one arrowhead; No. 2, twelve muscle shells; No. 3, five muscle shells; No. 4, fourteen muscle shells; No. 5, a perforated bear's tooth, a small piece of lead ore, and a small piece of red clay of irregular shape; No. 6, two muscle shells, a small copper ornament, oval in outline, flat on one side and convex on the other, with a small hole on each end for inserting a string. It is made of a thin sheet of hammered copper, the edges of which were notched in order to fit around a wooden pattern of oval shape; No. 7 contained five muscle shells and three arrowheads; and No. 8, three muscle shells and nine arrowheads. The bones were all in fine condition, but had been gnawed by some wild animal. With each lot of bones were pieces of skull, which had also been gnawed, and in each case (four only) where there was a lower jaw, it was placed at the opposite side from the pieces of skull. On the east side of the rock heap, and on a level with the top surface of the cist covers, and extending nearly north and south, was a ridge of fine, yellow, sandy clay, seven feet in length, two feet in width, and about one foot in height, which had slightly flattened ends looking in outline somewhat like a double-bladed paddle, but just why this was constructed was not evident. The first three feet of the top of the mound was a highly-colored sandy clay; the next three feet, black loam, and beneath the latter, clay, sand, and loam intermixed." 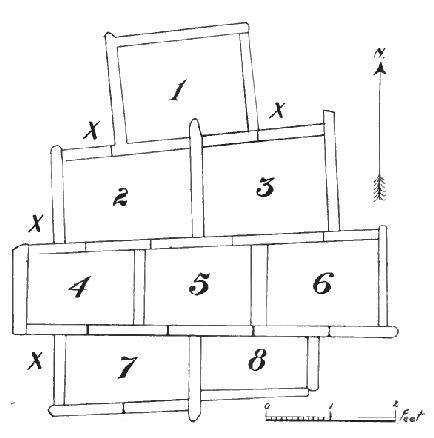 Figure 3: Stone boxes ("cists") found by Lewis at base of Mound 12. The crosses in the external corners indicate other places that human remains were found. "…[on August 13th, 1882 we excavated] No. 13, which was 30 feet in diameter and 4 feet in height. At a depth of twenty inches, and near the center, were six large boulders- one in the center and five surrounding it. Under the central boulder was a badly decayed skull, but no other bones. At a depth of three feet, and four feet a little west of south of the center, was a second skull face upwards, and beneath it were the leg and arm bones only. At a depth of four feet three inches, and four feet southwest of the center, were the badly decayed remains of two skeletons with their heads to the eastward and evidently facing each other." "[On June 12th, 1883], No 14, which was 36 feet in diameter and 5 feet in height, was excavated, and near the center, at the depth of five feet three inches, were the remains of five skeletons, and with them one arrowhead, five spoons made from muscle shells, and seventeen large muscle shells". "On August 16th,  No. 15 was excavated. It was forty feet in diameter and four and one-half feet in height. At a depth of three feet eight inches, and about four feet nearly north of the center, was a decomposed skull. At the base near the center, an excavation or pit five feet in diameter extended down into the gravel to the depth of two and one-half feet. In the bottom of the pit were some badly decayed human bones evidently parts of three skeletons, a number of muscle shells and one small arrowhead. The pit above the bones was filled with fine, clean river sand. Scattered through the mound were over 100 muscle shells of various kinds and sizes." "On June l2th, 1883, Mound No. 16, which was 28 feet in diameter and one and one-half feet in height, was excavated. At a depth of two feet, in a two-inch stratum of black loam, were portions of three skeletons, one of which was that of a child about six years of age. All of the bones were piled in a rather promiscuous way without any apparent order. On the western side of the bone heap were nineteen round water-worn stones about the size of a walnut, and opposite to them was about one bushel of river gravel. With the bones was a small chipped implement of rude workmanship." Further notes: An earlier version of the Mounds Park pavilion was built in 1905 over the location of Mound 16. Therefore it is likely that both the landscaping and the soil have been greatly modified since the mound was destroyed in the 1896 landscaping. Lewis’ sketch’s from the 1880’s shows the bluff line taking a turn to the north and wrapping back around mound numbers 15 and 16. Mound 16 was shown as positioned at the edge of that bluff. "[On June 12th, 1883] No. 17, which was 20 feet in diameter and one and one-half feet in height, was… opened. At the center, at a depth of two feet, was a few fragments of bone, nine muscle shells and one arrowhead, which were covered by five thin pieces of limestone." Mound 18: destroyed when Mounds Boulevard was graded (sometime before 1862). No record of excavation.